Your local Hussey Seating expert can help you study all your lecture hall seating options and choose lecture hall chairs that always ace the test. Hussey Seating Company’s high school, college and university lecture hall, auditorium and performing arts seating always makes the grade in educational environments. These seats were made to withstand the daily use of students of all ages all while having a whisper quiet return to the stored position. 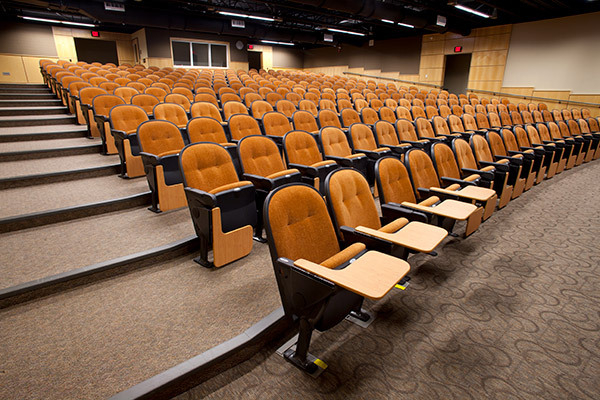 Whether you are building a new lecture hall or retrofitting an existing lecture hall, your local Hussey Seating expert can help you study all your lecture hall seating options and choose lecture hall chairs that always ace the test.